The final trading session of the week opened with losses across the board in precious metals values. Gold market players continued to show concern about the latest reported dip in global demand for the yellow metal. While last Friday surveyed traders were almost unanimous in their forecast for higher gold prices this week, gold is now showing that it could finish the week with a net loss instead. Spot quotes showed gold falling by $5 to 1,711 and silver by 25 cents to $32.35 the ounce. Reuters News relays that “technical analysis suggests that spot gold could test support at $1,701 an ounce, a break below which will open the way towards $1,672.24,” according to its market analyst ,Wang Tao. Platinum headed lower and touched $1,553 with a decline of $16 while palladium eased by $2 to reach $628 this morning at the open. Rhodium continued unchanged at $1,175 per ounce. US dollar strength continued and the American currency was last seen at 81.16 on the trade-weighted index, up almost two-tenth of a percent. In the physical markets, it was, once again, a case of good news/bad news from the traditional epicenter of gold demand – India. That country’ “Festival of Lights” brought a surge in gold sales on Sunday and news that local gold associations figure on a 30% gain in such sales vis a vis last year. However, the traditional backbone (up to 70%) of India’s physical demand – its rural regions – are set to close out the festival season with an estimated decline in 2012 sales of up to 20% at local gold-vending outlets. Just one day after the most recent World Gold Council quarterly gold demand survey indicated a gain in Indian gold demand in the last quarter, that country’s government slapped higher import tariff values on the precious metal. Official efforts to curb Indian appetites for gold and silver continue to reflect the fact that India’s economic managers are not happy with the amount of rupees that gold imports contribute to their nation’s current account deficit. Gold prices fell to a one-week low and to within less than $4 of the pivotal $1,700 mark on Thursday as a fresh statistical release by the industry’s leading trade promotion group revealed a notable ebbing in third quarter demand for the precious metal. More on the World Gold Council’s periodic report will follow below. Spot gold dropped on the back of fund selling and was unable to recover despite some unsettling economic data (NY area manufacturing and initial jobless claims both came in with unpleasant numbers owing to the disruptions caused by Hurricane Sandy). Even the marginally weaker US dollar was unable to offer support to bullion values yesterday. Crude oil lost more than a buck per barrel after the revelation that the eurozone has slipped into recession mode for the second time in four years. European locales witnessed the largest anti-austerity protests as of yet yesterday, on the other hand. From Italy’s Pisa to Sicily, from Belgium to Spain, and from Greece to France, angry demonstrators in unison declared “Austerity Kills!” as they stood against what they claim are German-imposed cuts on their standards of living and on their rights to traditional [European] social benefits. It was, in fact, a day of pretty much uniformly crimson prints across the price boards –in stocks, commodities, and a number of currencies. In the case of platinum, the principal price-dragging factor was the announcement that the strike at Anglo American Platinum came to an end. Still, the end result of the prolonged labor action at the firm is the loss of nearly 180,000 ounces of platinum production. Major refiner Johnson Matthey warned the other day that the platinum market will swing into deficit mode for the current year. The firm anticipates South African platinum output to fall by 12%, to an eleven-year low of only 4.5 million ounces in 2012. In its 2012 Interim Review, JM projects a decline of 11% in 2012 platinum recycling, but also sees a 1% decline in the metal’s offtake by the pivotal automotive sector. JM also figures that jewellery demand for platinum could reach a three-year high this year. The bulk of a forecasted decline in platinum demand could come from the industrial sector; a niche that includes platinum being used in glass and electrical applications. As regards palladium, JM’s review indicates that platinum’s close relative will experience a 2012 deficit as well (estimated to be near 915,000 ounces) as a result of a 6% drop in production (to a nine-year low of 6.6 million ounces) and a decline of 500,000 ounces in official Russian sales (to only 250,000 ounces). Overall palladium demand could rise to nearly 9.75 million ounces this year. The firm offered a trading range projection for palladium over the next six months that mirrors the metal’s price band over the past year or so as well: lows near $550 and highs near $750 per ounce. The trading week that is about to conclude certainly continued to feel the impact of the anxieties related to the looming “Fiscal Cliff.” Almost every decline and/or gain in some assets was eventually attributed to one camp or another worrying or not worrying about the leap from that rock come January 1st. We have, however, uncovered an interesting angle to the story (in terms of forecasting the fate of the dollar at least) from bankers UBS. We noted the other day that certain cycle patterns might be pointing to a period of dollar-strength ahead. Before dismissing such a take, consider the scenarios offered by UBS: the falling-off-the-cliff one, as well as the not-falling-off-of-it one, are both…dollar-beneficial in UBS’ view. Such a possibility should be factored in by almost every gold bull that is un-hedged and still expects total dollar-destruction to occur. This week’s release of the FOMC minutes once again ignited discordant discourse from the camps that believe the Fed will continue to ease until “well beyond 2015” and those who see the US central bank pulling back from the era of ultra-easy money “much sooner than that” (read: 2013?) as US economic conditions continue to improve. The idea of tying Fed policy not to a specific calendar date but to the readings on inflation and on unemployment levels was also floated this week. While that could be an interesting departure from current, calendar-pegged policy, there is already disagreement about what particular number might constitute the trigger for the Fed to begin to hike rates. Some Fed Presidents see 7.25% US unemployment as that “Holy Grail” number, while others are insisting that 6.5% or even 5.5% is to be the target for the Fed to hold out for before it departs from the near-zero rate environment. There is not much disagreement however on the inflation target; it remains for many of these decision-makers the goal to try to adhere to. On the other hand, there are also those who say that enough is enough already, and that the Fed should stand ‘pat’ and then some. To wit, Marketwatch reported that Richmond Fed President Jeffrey Lacker said that the Fed should “not be purchasing more assets in the market as bank reserves are already large enough to support a strengthening recovery.” Mr. Lacker also said that the Fed had “the tools to exit its ultra-easy policy when needed” but that “the larger our balance sheet when the time comes to withdraw monetary stimulus, the more difficult and risky that process will be." Moving on, we come the subject of this week’s LBMA conference that took place in Hong Kong. Whereas, just one year ago, the 700-odd delegates to the event predicted that, by this week of 2012, gold would be trading at no less than about $2,110 per ounce, their enthusiasm for $2k+ gold for next year has been somewhat…moderated. The current consensus forecast for the gold price by the time the 2013 LBMA meeting takes place calls for about $1,849 per ounce (give or take). Finally today, we focus on the latest “Gold Demand Trends” from the World Gold Council. The quarterly publication offered little in the way of comfort to those who continue to claim that gold fill find its way into various hands regardless of price and/or economic conditions. The third quarter of this year did show a 10% improvement in bullion demand vis a vis the second one but it was down by 11% on a year-on-year basis. Recall that the past quarter was largely shaped by the build-up to the Fed’s QE3 package for many commodity players. One glance at the hard numbers for third quarter gold demand speaks volumes – provided one is willing to hear and see them as they are. Apart from a 48.6 tonne increase in gold ETF demand (a gain that is most likely entirely attributable to spec funds playing their cards ahead of the Fed), the remainder of the areas from which gold demand normally emanates all showed sizeable declines on the trimester. To wit: jewellery demand was down 2%, industrial demand was down by 6%, bar and coin demand was down by 30% (! ), and central bank purchases (of late, the last/best hope for the bulls) were down 31%. Suffice it to say that these are…demanding trends. Among some of the key findings in the WGC report are the facts that European coin and bar demand slumped by a sizeable amount (more than 50%) on the quarter, despite the intensity of the debt maelstrom that continued to buffet the region this year. US-based would-be gold investors also crossed their arms during the past trimester, despite the Fed’s largess, the approaching elections, and the looming Fiscal-You-Know-What. At around ten tonnes of coin and bar demand, America’s quarterly offtake was the weakest since the second trimester of 2008 (the time when gold first pierced the $1,000 per ounce level). If the trend stays on course during the current quarter, global gold coins and bar demand might just revert back to 2010’s level of about 1,200 metric tonnes. 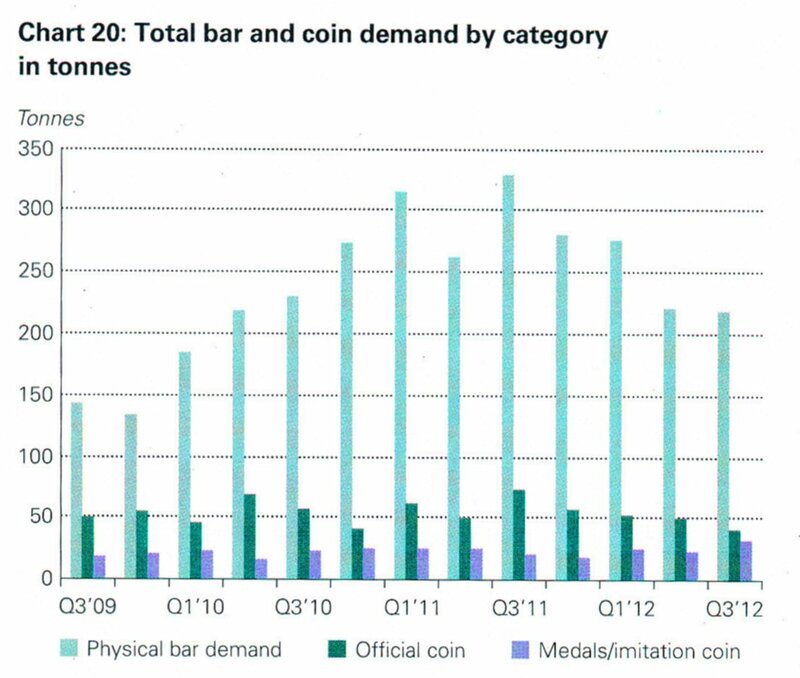 It is worth noting that the dissection of the coin and bar demand actually reveals a 43% fall in official coinage demand and a 33% slide in physical gold bar demand. It will also be worth keeping an eye on the much-vaunted gold ETF demand when the final 2012 tally will be made. In 2010, that niche absorbed 382 tonnes of gold, while last year it demanded only 185 tonnes (less than half)of same. Up to the start of this trimester there was but a five tonne (give or take) improvement in such demand versus last year’s total. We have repeatedly been taught that such conditions are the very ones that would lead to unprecedented stampedes into bullion. It was not to be. Furthermore, the illusion that Chinese gold demand would continue to mushroom no matter what gold’s price tag or domestic economic conditions might be, was also dealt a blow in the recent statistical compendium of the WGC. The past trimester witnessed a 5% decline in jewellery demand and a 12% fall-off in investment (bar and coin) demand in China. The blame is squarely being laid on the overt slowing of the Chinese economy. We have repeatedly warned that the segment of the population with a sufficient amount of disposable and/or investable income – China’s middle class – cannot/will not step up to the golden plate when and if their pockets cease swelling with new-found wealth. Worse yet is the perception that somehow Chinese investors tend to buy into rising, not falling gold prices. While that might be true of their trend-following North American counterparts, we beg to differ and see Chinese (as well as Indian) gold consumers as not only price-conscious but as astute price bottom-pickers. And, it was not just Chinese buyers who opted to remain on the sidelines in the third quarter of this year. Folks in Thailand, Viet Nam, Indonesia, and South Korea (traditionally strong gold aficionados) did the same and generated a 60 and 39 percent respective slump in local (Thai and Vietnamese) gold demand. Turkey has been held up as being another country from which insatiable gold demand would continue to come. As it turned out, that country’s quarterly gold demand declined by 66% on a year-on-year basis as locals took profits instead of chasing gold prices higher. The Middle East reported coin and bar demand declines of 29% in Saudi Arabia, and 28% in the UAE, while other Gulf states reported a 26% fall-off. Only Egypt showed an improvement of 1.4 tonnes versus the same period of 2011. Finally, Japan continued on its now six-year long trend of gold dis-investment and tallied a net decline of almost five tonnes for the period in question. You will need to consider all of the above the next time you open your latest installment of “News From Armageddon” and read about a “global gold rush” by investors from various countries. In dollar volume terms, the global gold demand for the July-September period was down by 14%. No lipstick necessary, please.